Slitta a settembre o forse ottobre la trasmissione del concerto di Comicoperando registrato ad Amsterdam lo scorso 19 maggio dall'olandese VPRO Radio 6, dopo i ritocchi al missaggio voluti da Chris Cutler. Agli iscritti a una sua newsletter Bruce Lee Gallanter di Downtown Music Gallery invia una dettagliata cronaca dell'edizione di quest'anno del Fimav di Victoriaville, e del concerto di Comicoperando, posto a conclusione dell'intero festival, così riferisce: "The final set this year was the much anticipated ComicOperando: The music of Robert Wyatt by another international cast. 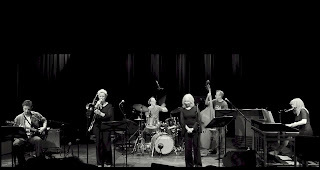 The all-star sextet featured Dagmar Krause on lead vocals, Karen Mantler on Hammond organ, harmonica & vocals, Annie Whitehead on trombone, Michel Deville on electric guitar & vocal, John Edwards on contrabass & vocal and Chris Cutler on drums. There are a number of things about this set which kept the anticipation so intense. Dagmar Krause used to sing lead for Henry Cow, Slapp Happy & the Art Bears, three very important bands in the history of serious progressive music. Dagmar has never performed in the US much to the dismay of Henry Cow & Art Bears fans here but did perform in a duo at Victo a few years back. Drummer Chris Cutler was also a member of Henry Cow & the Art Bears, as well as with the Art Bears (Reunion) Songbook which took place at Victo a few years back. Robert Wyatt is the favorite singer and songwriter of many of those who consider themselves to be Canterbury fans and/or serious progressive music enthusiasts. Mr. Wyatt retired from singing on stage more than thirty years ago except for a handful of special occasions, all of which were in England. So getting a chance to hear songs from many of Mr. Wyatt's great records played live was indeed a rare treat. 'Rock Bottom' is considered by many (myself included) to be Wyatt's masterwork and for this set we heard four of those special songs - Wow! I believe it was Karen Mantler who put this fine group together and she did a great job. Karen is the daughter of Carla Bley & Michael Mantler, both of whom are/were good friends of Robert's and utilized his voice on a few of their own records. The sixteen songs that were chosen were taken from Robert's long career which started back in 1967 with Soft Machine through Matching Mole and his long solo career since. The earliest song was Hugh Hopper's classic "Memories" which was once sung by Robert on an early Daevid Allen solo record and here sublimely sung by Dagmar. Another earlier song was "Gloria Gloom" from the second Matching Mole album which was given a spooky, reflective treatment, better to consider the words that really make you think. Another unexpected delight was "Solar Flares" from 'Ruth is Stranger Than Richard', sung well by Karen with special attention to the complex arrangements. The first encore also included the silly "Soup Song" also from 'Ruth...' which was well handled by Dagmar. The majority of the songs were taken from later Wyatt albums and each one was well-chosen. Besides organ, Karen also played some delightful chromatic harmonica on a couple of pieces. It was great to hear acoustic bass great John Edwards playing songs instead his usual improvising work and he even sung one song and sounded perfect for that song. Guitarist Michel Delville is from a band called the Wrong Object who I hadn't heard of. He also played well with that Mike Oldfield-like sustained tone that works so well on 'Rock Bottom'. The real treat for many of was getting to hear "Little Red Riding Hood Hit the Road" (with Annie Whitehead replacing Mongezi Feza on trombone), "Little Red Robin Hood Hit the Road", "Alifib" and best of all "Sea Song" which sent chills up and down my spine and brought tears to my eyes. Although it might have been too low key for some, I thought it was the perfect way to bring this festival to a grand close". Del Fimav, e di Comicoperando, ha scritto anche Nicolas Houle in http://tinyurl.com/6gzfr3p avendo in precedenza raccolto qualche commento direttamente da Dagmar Krause, in http://tinyurl.com/63vkvor. Altre succinte cronache sono in http://tinyurl.com/65hs9rz e http://tinyurl.com/6adze7a.